Sandra O'Toole is the president of the Outer Alliance, which stretches from the asteroid belt to the Oort Cloud beyond Pluto. Resurrected following the death of Justin Cord, the unincorporated man, O'Toole has become a powerful political figure and a Machiavellian leader determined to win the civil war against the inner planets at almost any cost. And the war has been going badly. Choices have to be made to abandon some of the moral principles upon which the revolution was founded. It is a time of great heroism and great betrayal, madness, sacrifice, and shocking military conflict. Nothing is predictable, even the behaviour of artificial intelligences. There may be only one way out, but it is not surrender. Fans of SF as a vehicle for ideas will devour this intriguing debut . The Kollin brothers keep the plot moving briskly despite the high proportion of talk to action. Their cerebral style will especially appeal to readers nostalgic for science fiction's early years. "Publishers Weekly on The Unincorporated Man"
Recalls the emphasis on freedom of the early works of Heinlein and the cutting-edge social commentary of William Gibson and Fritz Leiber. A good choice for most libraries. "Library Journal on The Unincorporated Man"" Praise for "The Unincorporated Man"
"A bright, stimulating work that deserves a wide readership." "Fans of SF as a vehicle for ideas will devour this intriguing debut.... The Kollin brothers keep the plot moving briskly despite the high proportion of talk to action. Their cerebral style will especially appeal to readers nostalgic for science fiction's early years." "Recalls the emphasis on freedom of the early works of Heinlein and the cutting-edge social commentary of William Gibson and Fritz Leiber. A good choice for most libraries." "--Library Journal" Praise for "The Unincorporated Man" "A bright, stimulating work that deserves a wide readership." 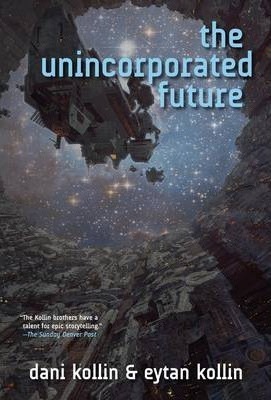 --Gregory Benford, author of the Galactic Center Saga "Fans of SF as a vehicle for ideas will devour this intriguing debut.... The Kollin brothers keep the plot moving briskly despite the high proportion of talk to action. Their cerebral style will especially appeal to readers nostalgic for science fiction's early years." --"Publishers Weekly" "Recalls the emphasis on freedom of the early works of Heinlein and the cutting-edge social commentary of William Gibson and Fritz Leiber. A good choice for most libraries." "--Library Journal"
Brothers DANI KOLLIN and EYTAN KOLLIN live in California. Their books include The Unincorporated Man, The Unincorporated War, and The Unincorporated Woman.